The Legible London project has been producing clear, attractive maps of parts of London, to help people navigate unfamiliar streets by foot, for a few years now. The maps appear on numerous way-marking plinths around the capital, helping people to get from A to B effectively. 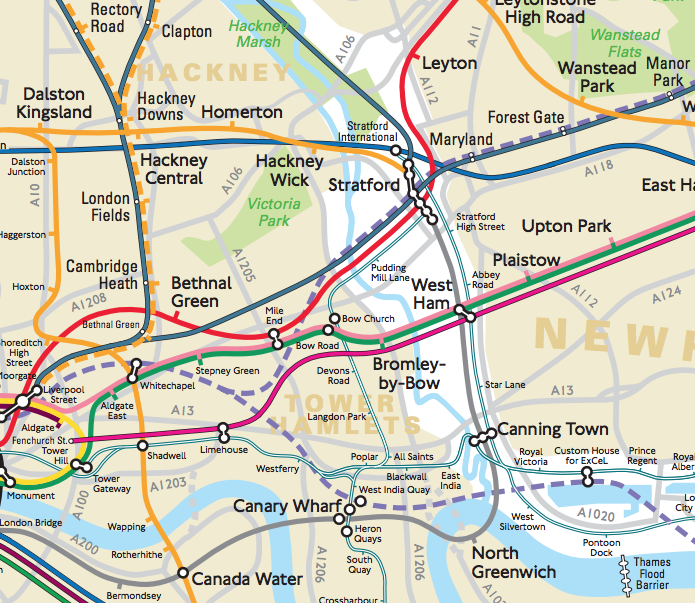 During the Olympic Games in 2012, paper Legible London maps were made available at key stations, to encourage people to walk rather than overload the tube/train network, but generally, the maps are not available online. 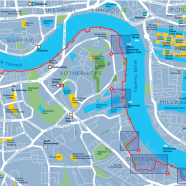 Recently, however, the project has created maps for several of London’s signed long-distance walks, and these are available for download. 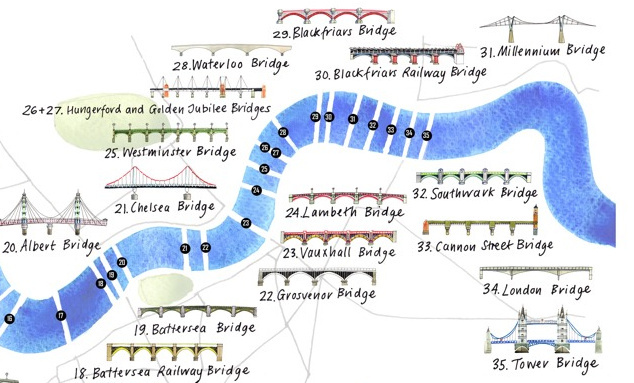 As an example I’ve picked Section 7 of the Jubilee Greenway, one of London’s long-distance paths that was put together for the Queen’s Diamond Jubilee, also celebrated in 2012. This particular path spends quite a lot of time on the Greenway (aka the Northern Outflow Sewer!) 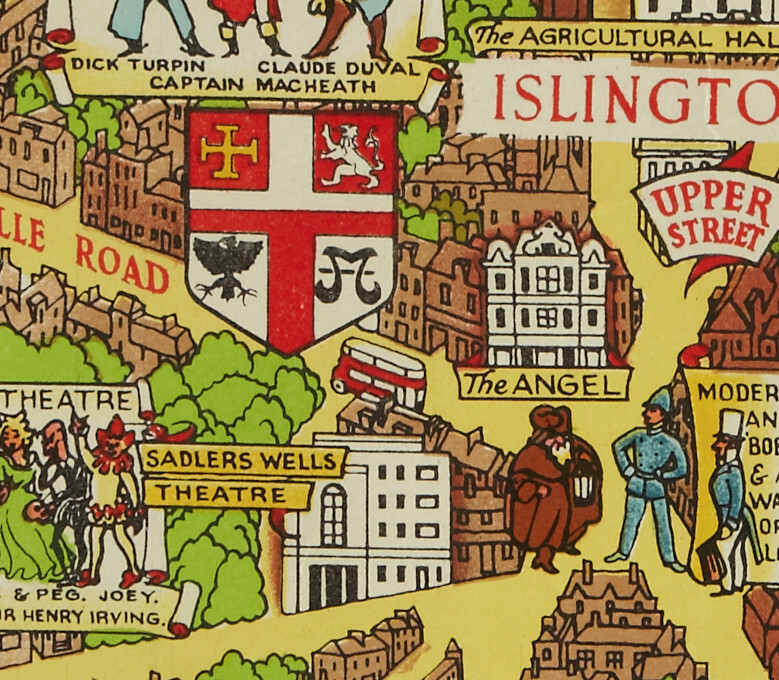 in east London, but also includes some more classically touristy sections. Section 7 is a nice balance between the industrial and touristy parts of London, going through the industrial/changing Deptford waterfront and residential Rotherhithe but also passing the Cutty Sark of Maritime Greenwich and Tower Bridge. Direct link to the PDF. The maps use a clear and consistent colour theme, with a relatively small number of colours resulting in attractive cartography. 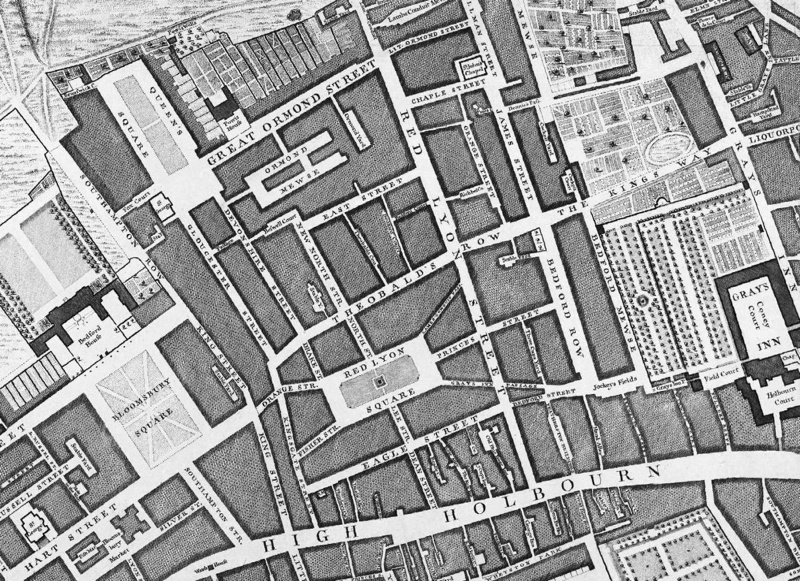 Only major buildings and landmarks are shown, in yellow, with a selection shown in 3D on some of the inset maps. The route is shown clearly, with a red line, and with links to stations, and diversions, as red dashes. 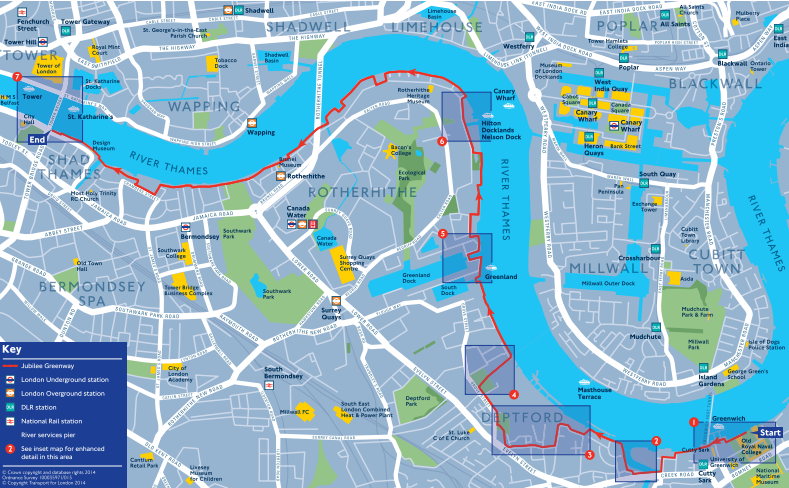 You can download section maps for most of London’s long-distance paths, on a new part of the TfL website. Hat-tip to Diamond Geezer for spotting the new maps. 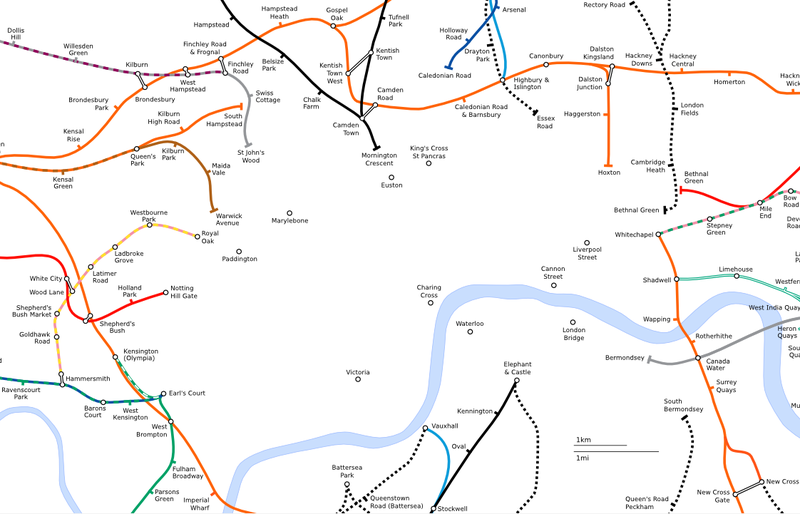 Where can we access the map of the distribution of the Legible London? Is it available for public? 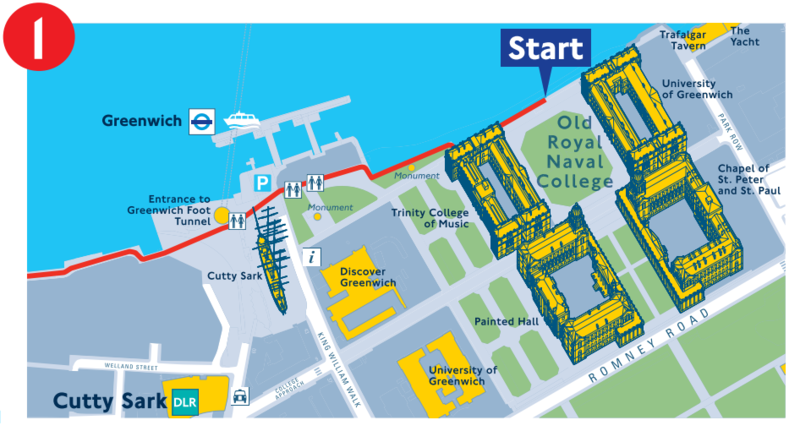 are the paper maps produced for London 2012 olympics still available – if so where from? It looks like there are lots on eBay.